You may have read all the latest parenting books but have yet to implement any of the ideas or suggestions. There is something that is holding you back but you can’t figure it out. The answer could be procrastination, putting things off in other words. Find out if you're a procrastinator by understanding the different types of procrastination. If you are a decision avoider then you need to work on making decisions and if you are a task avoider then you need to work on getting into action. If you are both a decision and task avoider or a temporary procrastinator then you need to work on both areas. There are two types of procrastinators: those who put off making decisions, and those who put off taking action. Those who delay making decisions do so because they depend on others to decide for them. This relieves them of taking the responsibility for failure. As to those who delay taking action, there is a gap between their decision to act and them doing the task. Which type of procrastinator are you? Are you the decision avoider or the task avoider, or both? Or are you not a chronic procrastinator but one who just procrastinates? The difference between a procrastinator and one who procrastinates is that the first one does it all the time and it affects every aspects of his life whereas the second one puts off doing some of the things. I would have to say that I am one who procrastinates. I am usually task-oriented and can get many things done, except when it comes to my Big Goals. Year after year I put them off, always telling myself that this is THE year that I will achieve my goals, only to have another year slip by with nothing to show for it. Does this sound like you? No matter what type of procrastinator you are, focus on the area that you are weak in to help you get started on becoming the best parent. Make Intention: Make the intention that this is the time to get productive. Each one of us has tasks to do. We are not here on this earth to waste our time. 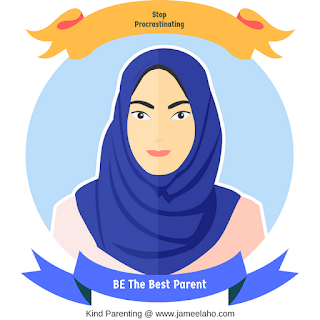 If you have children then your task is to be the best parent you can. Say InshaAllah: Don’t forget to say “InshaAllah (If Allah wills)” Allah says in the Qur’an: ‘And never say of anything, “I shall do such and such thing tomorrow.” Except (with the saying), “If Allah wills.” And remember your Lord when you forget and say, “It may be that my Lord guides me onto a nearer way of truth than this.” (Qur’an, Kahf 18:23-24) Remember Prophet Sulayman who intended to have an army of sons by his wives but he never said “InshaAllah” and ended up with only one disabled boy (Muslim). Nothing happens except by the Will of Allah. Take Responsibility: Take responsibility for your actions and put your trust in Allah. Your actions are recorded down so you cannot blame anyone else for them. Allah will judge you on your intentions and actions. If you are too afraid to act then you won’t have many good deeds written down and you won’t get any results. It may be that you need to set some ground rules. Be the one to do this. Don’t just depend on your spouse to be the one to set limits and then blame him by saying to your children, “Your father won’t allow you.” Children need to understand that you can be firm as well. Change Yourself: Change the way you think. Stop dreaming about what you will have (perfect children) or will do (be the best parent) and start doing something to get you to your dreams. Nothing comes to you by doing nothing. You can change your thought patterns from negative to positive. Tell yourself that you choose to do it and can do it, and that you can reach your goals. Then act upon it. Change the People around You: Surround yourself with the right people who are supportive of what you do. Sometimes we are afraid to take action for fear of being ridiculed for failing. At other times we are influenced by others. If they are procrastinators and naysayers then you will become one too for hanging around them but if they are action takers then you are likely to be one as well. Narrated Abu Musa: The Prophet said, 'The example of a good pious companion and an evil one is that of a person carrying musk and another blowing a pair of bellows. The one who is carrying musk will either give you some perfume as a present, or you will buy some from him, or you will get a good smell from him, but the one who is blowing a pair of bellows will either burn your clothes or you will get a bad smell from him." (Bukhari 67:442) People in your company have a habit of influencing you. Overcoming procrastination takes two steps: make the decision and then act. So be decisive and make the decision to act. Then get into action by taking that first step. Just do it. If you can relate to all of the above and want to read more on it then read my book ‘Successfully Done’. Click on the link and it will take you to the book. This book is not geared only towards parents but to anyone who wants to reach any of their goals. You will get action steps to help you reach your goals. Start today.